A small, Victorian copper pipe mould. This piece has no manufacturers marks but, on the side, is a pattern number ‘9’. It dates from c.1890. The design has two tiers of stylised leaves, with seven small domes to the top. 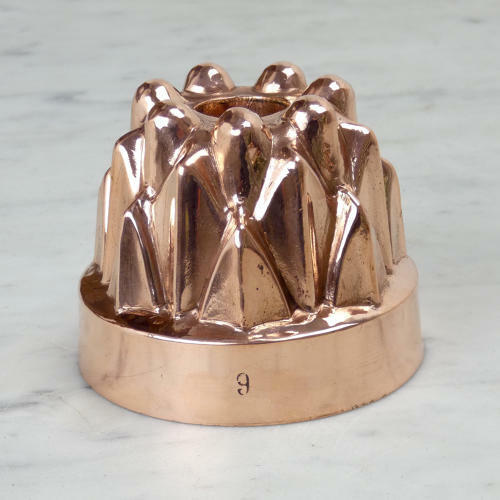 It is well made, from a heavy gauge of copper, and is in very good condition. The tinning, to the interior, is still in very good, usable condition. Pipe moulds were often used for baking. They are very practical as the pudding or cake cooks from the inside as well as the outside so the middle doesn’t end up stodgy.